Here is some of her work. Her personal information follows. In numerous Canadian cities, institutions, galleries and museums, including the Canadian Museum of Civilization. Georgette Kambani has participated in more than 50 exhibitions in Quebec City and Ottawa with members of different artistic organizations. Invited by artistic and cultural organizations, she presented about ten lectures on Greek art, art and spirituality and her own artistic and cultural development in libraries, universities, galleries etc. There are about 20 books, mostly poetry, that she has illustrated in Greece and in Canada. 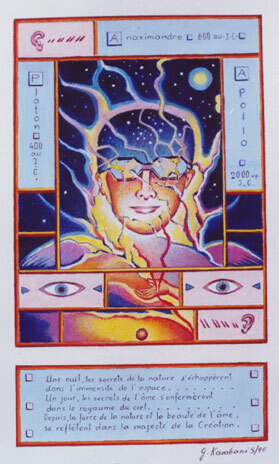 Ten posters also show her graphic design ability. As a member of many artistic and cultural organizations, she has organized projects, coordinated activities and presented workshopss in schools and studios. In 1994, she was a television hostess on Hellenic Kaleidoscope, interviewing poets and authors of Greek origin. 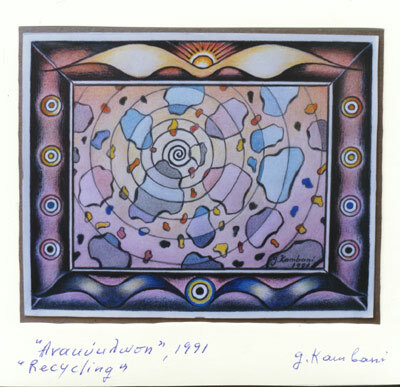 1992-1999 The Franco-Ontario Artists B.R.A.V.O. In 1992, commemorative plate “Canada 125” received from the Governor General of Canada for the project entitled Greek Canadian Symposium, pressented by the Hellenic Cultural Association PARNASSOS. She also received awards during exhibitions and many letters of appreciation by specialists in visual arts. From Parnassos, commemorative plate, 2000. Many articles and reviews in newspapers and interviews on television and radio. Newspapers: “Estia”, 19/10/83, Athens, by Antonis Tsirbinos. Books: “Greek Artists Abroad”, published by the Ministry of External Affairs, Athens, 1983, page 178. Magazine: “Ereuna”, 1993, Athens, by Yiannis Koridis, director, page 4. Biographical dictionary: “Who’s Who”, Athens 1993 and 1994, published by Metron, page 271. Dictionary: “The Greek Painters from the 16th to the 20th century”, Athens, 1998, published by Melissa, vol. 2, page 101. Magazines: “Trito Mati”, February and April 2000, Athens paintings with comments “Endiamessi periohi”, no. 12, page 22, article by Dimitri Kitsikis (Ottawa).